The Good Shepherd by Delbert Satterfield is a four inch bad relief medallion cast in bronze tone hydrocal. 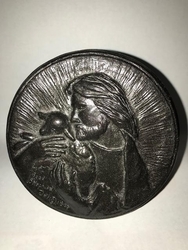 It depicts Jesus holding a lamb and was inspired by the Bible passage of Matthew 18:12 telling of the shepherd leaving 99 sheep to go and find the one sheep that is lost. This handcrafted piece of Christian art is an excellent conversation piece that provides an opportunity to share your faith with all who view it.